Importance. 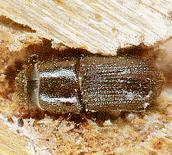 - The southern pine beetle is one of the most destructive pests of pines in the southern United States, Mexico, and Central America. This insect killed approximately 4.5 million board feet of pine timber from 1973 through 1977 in the southern United States. The beetle occurs from Pennsylvania to Texas and from New Mexico and Arizona to Honduras. It attacks and can kill all species of pines, but prefers loblolly, shortleaf, Virginia, pond, and pitch pines. Identifying the Insect. - The adult is shortlegged, about 1/8-inch (3 mm) long, and dark reddish brown to black in color. The front of its head is notched, and the hind end of its body is rounded. The larvae is crescent-shaped and whitish, with an amber head. When fully developed, larvae are approximately the same length as adults. The pupae are also the same size and white. The eggs are pearly-white and found in notches along either side of the adult egg galleries. Identifying the Injury. - The adults bore directly through the outer bark into the living bark. At each point of attack, the tree usually exudes resin which forms a small pitch tube about the size of a small piece of popped popcorn. Adult beetles construct winding, S-shaped galleries, which cut across one another and girdle the tree. 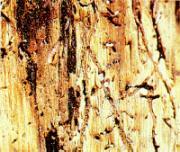 Blue-stain fungi in the sapwood, introduced by the beetles, hasten the death of the tree. The first indication of tree mortality is discoloration of the foliage. Needles become yellowish, change to a red color, and-finally turn brown. Trees may be killed singly or in groups, ranging from a few trees to several hundred acres. Biology. - Adults construct winding galleries in the inner bark, where eggs are deposited in individual niches on each side of the galleries. The eggs hatch into small larvae within 4 to 9 days. The larvae mine for a short distance before boring into the outer bark where they pupate. One life cycle can be completed in about 30 days under ideal conditions. There are from three to seven generations per year, depending on latitude, elevation, and climate. Control. - Natural enemies, such as diseases, parasites, predators and weather, help maintain beetle populations at low levels and bring cyclic outbreaks under control. Integrated pest management may be achieved through any one or all of the following suppression techniques: rapid salvage and utilization of infested trees, piling and burning of infested materials, chemical control in high value resources, and cut-and-leave (May through October). To select the most appropriate strategy, the user is referred to the Integrated Pest Management Decision Key (IPM-DK). Good forest management is the most effective method of preventing losses from the southern pine beetle.